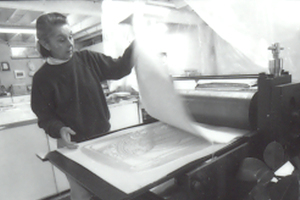 Handmade paper has an extraordinary capacity for deep embossing and since 1980, this has been the primary medium used to give artistic expression to my editions of original prints. An important feature of handmade paper is the rich textural surface and the exaggerated deckle edge which complements and visually adds to the deep embossing. Technique: These editions of embossed prints are created on an etching press from a “master plate” This “printing plate” has a depth of about one eighth of an inch. The “plate” is created as a collagraph or a lino-cut. For the last step, the pure white embossed paper is hand colored with a combination of an airbrush and individual touch-up brushes. Recently my own archival, digital photographs have been used, by collaging them onto the embossed paper. The entire technique includes a blend of three mediums: handmade paper, printmaking and painting. All paper is made from cotton fiber from North Carolina, it is beaten and formed into individual sheets. The paper is left to dry until it is dampened again for the process of embossing. Themes: My images are varied and could express views as seen in landscapes or they could be an abstraction of natural plant shapes and often they evolve as imaginary designs, sometimes of outer space. Early Works: Beginning with 1962, editions of etchings were created, using copper or zinc plates and then printed on Arches, Italia or German Etching paper. After 1980 my work also included mono-prints, cast paper and paintings on paper, using a large format (40” x 60”) In the period between 1990 to 2006 I became intrigued with Marbled Art. Travel: Having the opportunity to travel worldwide (many times with the International Artists and Paper Makers Association) a large collection of photographs has been assembled, a number of which have been in juried photo exhibits. Many times, these photos have been the inspiration for an edition of original prints.